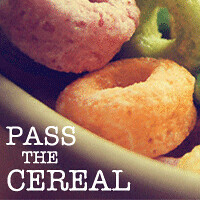 Pass the Cereal: Thank You With A Pop! Thank You With A Pop! There is a fabulous group of volunteers at my son's school that I get the honor of organizing. Really they do all the work, I just send them reminders each week. 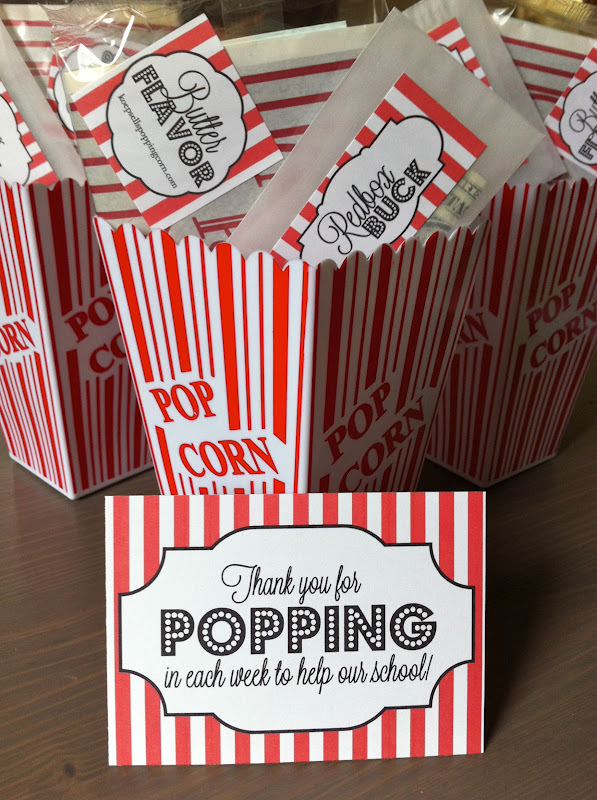 But I do like to give them a little something at the end of each school year to say thanks for all of their time (especially the time spent coming out in the snow and rain and cold to help). You can see the gift's from past years here and here. This year the gift was simple, so I asked the always amazing nellie*design to take my ideas and dress them up! As you can see, her work really made a simple gift special and super cute! 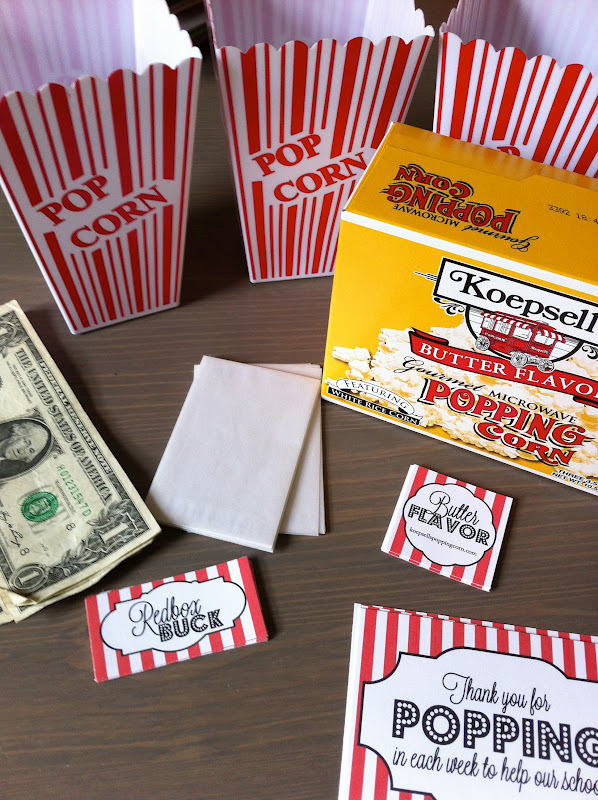 I printed the popcorn tags on sticker paper so they attached easily to the bags. 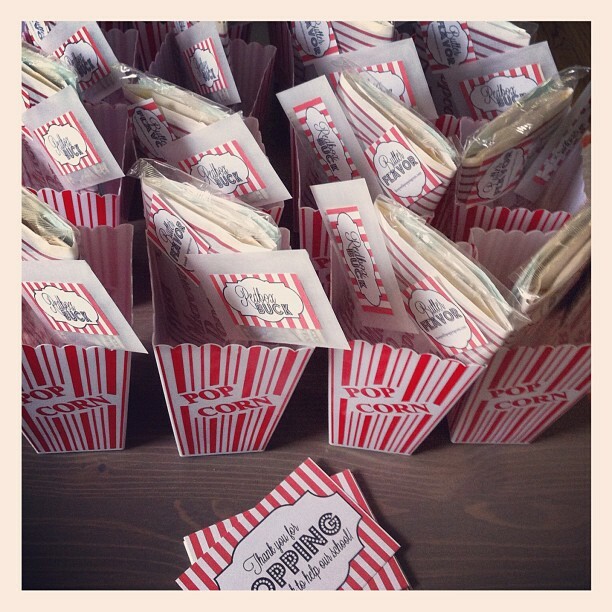 Double-stick tape worked well to add the Redbox buck tags to the glassine envelopes, but I also used it to adhere the envelopes to the popcorn bags. Attaching everything together made it much easier to deliver them given the quantity I had to fit in the passenger seat of my car. I added a quick thank you note to the back of the main card and then set out to quietly deliver them while the majority of the volunteers were at school. I hope they enjoyed finding a little surprise when they arrived home! Sorry about that...the contact information for nellie*design is updated now. The design was custom, but Nellie is really easy to work with, so I recommend contacting her if you are interested in the labels. Thanks!